No matter what condition you are in now, you can improve it and you will be better for it. We have patients that were obese and miserable with their lives. They could hardly walk down the hall without losing their breath, and enjoyed little in the way of hobbies or social activities. Some were born with deficiencies of the musculoskeletal system, some had suffered stroke, and some were amputees, as a result of trauma or diabetes. For whatever reason, they made the commitment to change their lives and now are an inspiration to others. They are all involved in some outdoor sport, including golf, bicycling, kayaking, or simply enjoying the outdoors through hunting and fishing. All of them are healthier and happier, and several have avoided the possibility of an additional amputation because they’ve improved their physical condition. The first step for most people is to consult your physician and ask their advice as to what types and level of activity they feel are right for you. Once you have decided on what your fitness goals are and what activities are right for attaining them, you are ready to make the commitment to a happier and healthier lifestyle. One way that many people find to make the transition more enjoyable is to locate an exercise partner with the same goals. It’s much harder to put off your routine when you know that someone else is depending on you. Remember that to maximize the benefits you receive through exercise you will need to monitor your diet as well. Not only will a healthy diet help you lose and maintain your weight, but it will also provide your body with the proper nutrients it needs to maximize your exercise program. Combining exercise and diet will yield the greatest results in the minimum time. Just remember that you may have spent years of low activity and eating fast food diet to reach your current physical condition, so allow yourself time to start seeing results and plan accordingly. Set realistic fitness goals. A regular exercise program does not mean spending hours in a gym every day pumping iron. If that’s what you want to do, then being an amputee certainly won’t stop you, but attaining and maintaining a target weight as well as improving your cardiovascular condition need not be a daunting task. There are many types of activities that you can enjoy which will provide you with the exercise that you need. 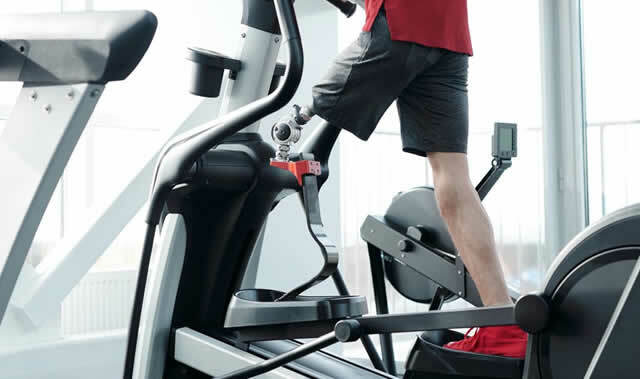 For some prosthetic and orthotic users, certain activities might provide all the exercise they need, yet do so in a way that minimizes impact to their body. Swimming is a great way for amputees to exercise. It provides significant resistance to the muscles yet places little stress on the soft tissue of the residual limb. Swimming is also an excellent way to improve endurance and cardiovascular conditioning. Golf is a very low impact activity that improves balance and coordination as you play. The newer, multi-axis rotational feet, and even simple additions such as rotational shock pylons, make the player’s swing much more natural and reduce the possibility of skin abrasion. Many amputees participate in skiing whether it is snow or water skiing. Both sports offer exhilarating exercise and can be enjoyed equally by both above-knee and below-knee amputees. Above-knee skiers may elect to ski without a prosthesis. Snow skiing requires the use of outriggers, which are simply poles with small skis on the ends while water skiing without a prosthesis requires no additional equipment. Cycling is an ideal way to exercise the residual limb in a smooth, repetitive manner that does not require the limb to bear the body’s weight. This strengthens the muscles and improves endurance without injuring the residual limb. Below-knee amputees can usually adapt to riding with little or no modification, while some above-knee amputees may need minor adjustment or modification to their socket to allow for a more free range of motion while pedaling. Transtibial amputees can ski slalom by using their sound leg forward and placing their prosthetic leg in the rear binding. It may be helpful to make the prosthetic a little shorter, so as to shift weight distribution to the rear. Some amputees elect to ski without a prosthesis and simply keep their residual limb tight to the side or front of their sound limb. A wide ski with the slalom fin moved slightly forward can aid in maintaining control. Not too many years ago, running for an amputee was considered nearly impossible. The tremendous advances in prosthetic devices have not only opened the door to jogging and recreational running but both transtibial and transfemoral amputee athletes now compete in all competitive running events. Prior to the 2008 Olympics, a bilateral transtibial amputee actually applied, and was eventually approved to compete in the World Olympics. Many amputees can enjoy riding with little or no modification to equipment. Some form of safety stirrup is recommended to allow the release of the prosthetic leg in the event of a fall. Special hand holds can be attached to the saddle to assist the beginner in maintaining balance. Amputees with bilateral transfemoral amputations or hip disarticulations usually require some form of bucket-type seat device. The North American Riding for the Handicapped Association can provide additional information. These are just a few of the many sports that amputees can enjoy. You could also consider basketball, baseball, soccer, tennis, bowling, skating, mountain climbing, and more. With the help of modern prosthetic technology and devices now available, amputees can participate in any activity imaginable. You may want to refer to our links section for contact information to various amputee and adaptive sports organizations.